Happy Mardi Gras! Here are the notes l took in Tom Sheldon’s Master Class. I don’t like to start without pictures, so I’ll checkpoint the line marking of Master Class # 70 first. The 2D trace trails off after a hidden quad begins a collapse, in the fourth line of line marking, by unraveling and flinging clues all over the place. And here is the grid at that point. You don’t get a hidden quad every day. OK, we had our playtime. 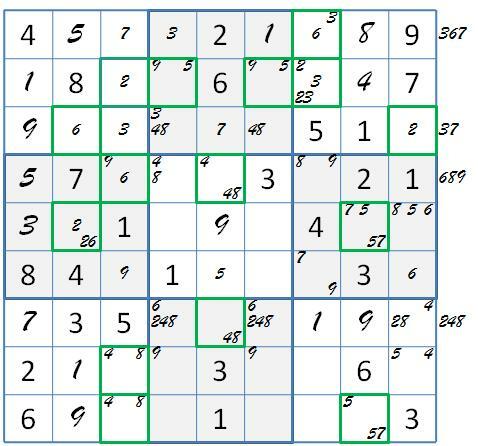 What about Tom’s instruction material in Sudoku Master Class? If you’ve waded through this blog this far, the “master class” label just may register as overblown hype. Tom’s 14-page instruction section claims to carry you through three levels of skill: essential, expert, and master. 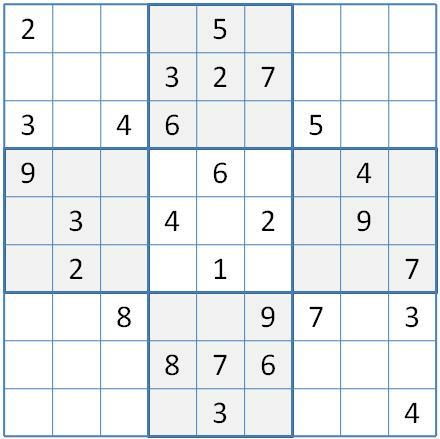 It actually is covered by sysudoku basic, regular fish and the uniqueness rectangle, type 1. Even back in the ancient publication year of 2006, that doesn’t qualify for “expert”, much less “master”. This is saying that alternate inference chains of all types are tainted with T&E because, to explain why they work, you have to say “if”. How can Tom label coloring as guess work? Is it because coloring depends on the assumption that one of two large sets of candidates in a cluster is true? Outside of quantum mechanics, that has sufficiently high probability to be regarded as fact! And Tom gives no hint about where the logic of Sue de Coq, orAPE, or ALS begins to crumble? If n squares share n numbers, and no others, then those numbers must go in those squares. If n numbers may be placed in n squares only, and no others, then no other numbers may go in those squares. Yeah. That’s just the problem. After you state the rule, you have to explain the point of it. Here, it is that the n cells are reserved for the n numbers because they have no other place to go. Other candidates in these cells have to leave, because the n numbers need all n cells. Unfortunately, Tom calls the naked locked set a Partnership, and the hidden locked set, a Buried Partnership. Fortunately, this jargon never caught on. No, I’m not embarrassed over slink and wink, Sudopod, LPO, pattern slink, sysudokie, or the verb to kraken. I’m a sinner, but I have some forbearance. Please tell me if I’m guilty of useless distinctions, such as Sheldon’s broken partnerships. Tom was impressed with this rule as well. He states it twice, on two successive pages of Sudoku Master Class. I came to realize that it covers regular fish, the two types being rows and columns. I was confident that with the box as a structure type, it would also handle Mutant Fish. But it fails to do that. The elimination method for mutant fish requires two sets of units, and these two sets may be a mix of the three types. The fish becomes mutant when the units include a box. Later on we will explore SudokuOne’s version of a general sudoku theory that does cover mutant fish, but that doesn’t fit in the same post as Master Class. Now having trashed the Sheldon claim to a master class level of Sudoku instruction, what about his guidance for basic solving? Tom recommends a box sweep similar to box marking, but only for discovering clues, not for slinks. He calls it “the Force”. It consists of “tram lines” – our double line exclusions, and “Pincers” – our cross hatch. Tom’s pencil marks are simple lists, even worse that the keypad plan. He only uses them to record the full set of candidates, and his only way to find these candidates is “The Complete”, the number scan we replace with line marking. In fact, Tom warns us to “Never leave a square half-marked up!”, leaving his readers to Force all the clues they can, then Complete the remaining squares, one at a time. If that is what you’re doing, pleeease go back to our beginners page and start all over. So when Tom illustrates the box sweep of box marking , which he calls channeling, his channels are defined by clues only. When sysudokies channel, the possible cells for a candidate are confined by box slinks and naked locked sets, as well as clues. More facts, less mystery, more progress. But what am I complaining about? Look at your other favorite Sudoku collection books. And your Sudoku instruction books, for that matter. How do they get the reader started? They may be due for a review next. Most of them make Sheldon look good. And many don’t make up for it on advanced solving either. Need another challenge? How about a Frank Longo Absolute Nasty, Level 4? I’ve got one with a good lesson in UR analysis, #71. A review of the Level 4 collection of 2007, recently re-issued in spiral lay flat form, is coming up. How about going for box marking and line marking this time. A very productive box marking makes line marking easy. The last post in every collection review will present highlight moments from the review puzzles. These are selected to illustrate SSOB techniques in action. So next post, there will be Master Class snapshots . This entry was posted in Basic Solving Procedures, Expert Reviews, Puzzle Reviews, Sheldon and tagged hidden quad, Sheldon Master Class, Tom Sheldon. Bookmark the permalink.